The app’s interface will be a button that when pushed will pop up a dialog box. This is how the app is going to look. The following snippets pertain to the class DialogsActivity. We need to know when the user clicks the button so we are going to make a listener. Inside the onClick function of the listener we will build and show our dialog. 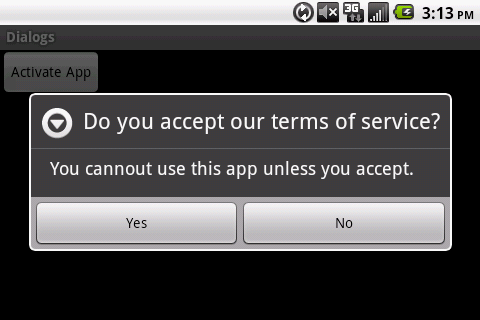 Our dialog will have a title, message and two buttons, the user will not be able to cancel the interface in anyway (clicking outside, or using the back button). This is how our dialog looks. 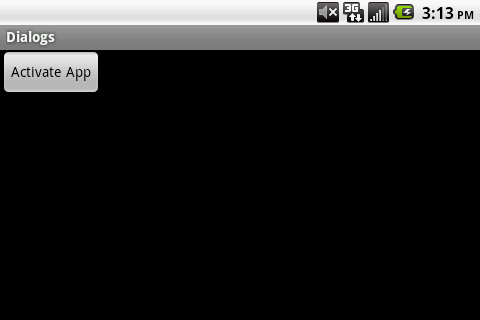 The Two buttons inside the dialog also need their own listener each, we named this listeners in the setButton and seButton2 functions. Notice that these onclick listners are not of the the class View but of the class DialogInterface. This is the full activity code.